The team behind Homeslice would be well within their rights to consider themselves pizza pioneers. 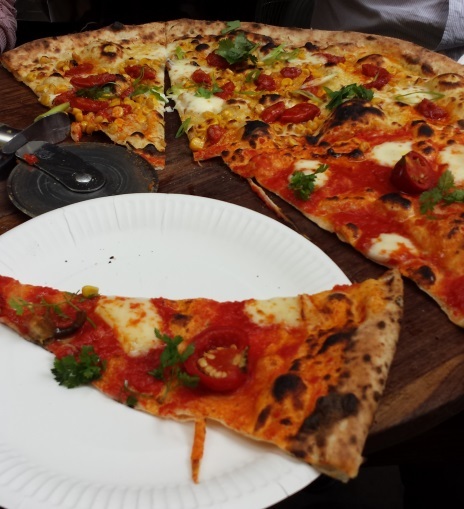 Their van was one of the early innovators on London’s now well established and increasingly diverse street food pizza scene, and they were also one of the first to transition to a bricks-and-mortar site, tucked away in Neal’s Yard, off Covent Garden. This pioneering spirit also extends to their enormous pizzas which boast a frequently-changing array of unusual seasonal ingredients from butternut squash to black pudding. However Homeslice should not be dismissed as a novelty pizzeria; these guys take their craft very seriously indeed. When one of our pizzas came out of the oven looking like it didn’t quite meet the restaurant’s exacting standards, it was immediately binned and a new one was made from scratch. Needless to say, we were suitably impressed by such an uncompromising focus on quality and the complimentary glass of prosecco (available here on tap) to apologise for the delay didn’t go amiss either. When the pizzas arrive the first thing you notice is their size. Homeslice pizzas come in 20 inch format only (though a couple are available by the slice) which provides something of a logistical challenge as this takes up most of the table. 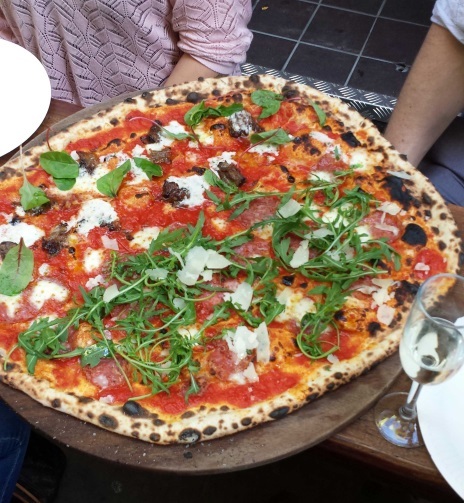 You can choose two toppings per pizza and we started off with oxtail & horseradish cream, and salami & rocket. The salami that day was flavoured with fennel and was so thinly sliced that it turned deliciously crispy at the edges in the 90-odd seconds it spent in the oven. The second half of our pizza had been the subject of much discussion at our table, with the idea of both oxtail and horseradish on pizza raising a few eyebrows, and indeed objections. However these fears soon turned out to be groundless; this really is an excellent pizza. The chunks of oxtail are intensely meaty while the horseradish cream gives a buttery depth of flavour that we have found to be one of the highlights of the Homeslice menu. Emboldened by the success of our first pizza, we chose corn, chorizo & coriander, and raschera cheese, spicy peppers & chervil for round two. Again, bold and seemingly incongruous flavour combinations came together surprisingly harmoniously on our plate. Corn and chorizo was a very successful pairing, with the corn in particular seeming surprisingly at home on the tomato-free base. When it came to our second half, instead of the chilli-heat we were expecting, the spicy peppers delivered a powerful, almost vinegary flavour that creates a similar sensation in your mouth but with a very distinct taste. This intensity is balanced by the salty raschera with the chervil providing a further twist. Two pizzas were more than enough for our group of four, but if you’re looking to round off your meal with some dessert you’ll have to look further afield as Homeslice serves pizzas and only pizzas. We recommend taking a stroll down to Scoop for a good selection of top-notch gelato. It’s just around the corner and open until 11:30 most days, so ideal for after dinner. 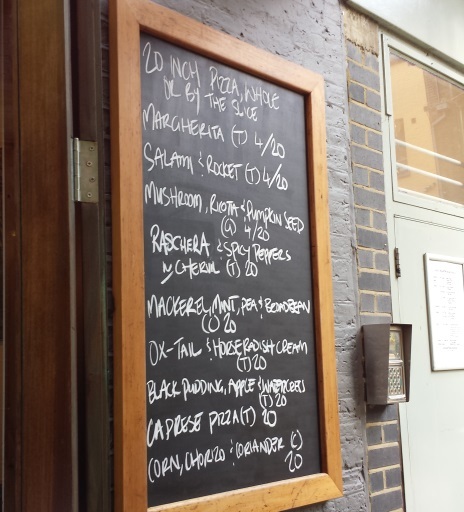 Homeslice is an excellent addition to London’s pizza scene and purists should not be put off by the seemingly outlandish flavours on offer. Over a number of visits every combination we have tried has worked well and although we haven’t quite mustered up the courage to try the apple and black pudding number yet, we’re sure this one would be delicious too. I LOVE Homeslice though I haven’t been to their permanent place yet. Definitely one of the best pizza joints out there. Ah well if you liked the van we’re pretty sure you will enjoy a trip to the restaurant.We’d be interested to know your thoughts if you make it down there at some point. Do you have any other favourites we should visit? Still haven’t been here! Tried their pizza at their pop-up at Frieze last year though and thought they were delicious. Thanks for the reminder to visit.